Mariah and her counterparts are working to build the Donga Pre-School for local students. In Benin, most villages have a pre-school. However, the town, lacks such adequate infrastructure. 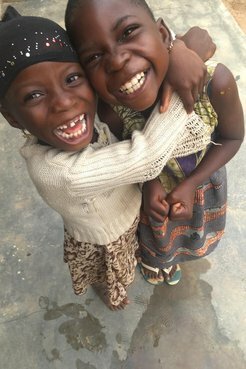 Because of this most students have to skip pre-school and go straight to primary school, leaving them scholastically behind other students throughout Benin. Also, because French is the language of instruction and not spoken at home, it's important that children begin learning it as soon as possible in order to be successful in school. This project aims to re-build the tarnished pre-school in order to form an adequate, stable, and safe learning environment. With a focus on fostering a love of learning and gender equality, the new pre-school will allow more young children to attend, provide more resources for the teacher, and will encourage and promote young girls' education. Alongside construction of the one room building, a workshop will be held for the teachers and staff of the pre-school and primary school addressing gender equitable practices, safe schools, and sanitation. This training will further build the capacity of the community to maintain an adequate learning environment and tear down barriers preventing girls' education. My community is excited to start the project and has already been an enormous help in starting this project. They have created a Parent-Teachers association for the new school and are committed to providing a few necessary materials and labor. In every meeting regarding community development, my two counterparts, host family, and language tutor has played a role. They will be the ones to spear head the project, gather materials, organize workshops, and motivate members of the community. Once it was decided that the village was in desperate need of a new pre-school, my host father created a Parent-Teachers association for the pre-school itself. The association consists of 12 community members who are dedicated to this project and carrying out its goals. Within the association there are two positions dedicated to promoting girls' education. The community members within these positions will speak to other community members on the importance of keeping girls in school. The adjunct mayor has agreed to lend his car in order to haul materials, while various other community members have offered to supply what they to the project and continue the Peace Corps legacy long after the last volunteer has left. The Parent-Teachers Association created to go along with this project will continue to exist after the project is finished. They will act as a liaison between the school and the community. They should continue to inspire parents to send their children to school, particularly their girls. The teachers and administration who attend the workshop will be given the skills to continue utilizing gender-equitable and other important practices in the classroom. Counterparts will continue to monitor the success of the project and ensure that newly learned behavior will continue to consistently be practiced. Over time, the school building will naturally deteriorate, but with simple upkeep and maintenance this building should last well past 2050. While the implementation of this project will take place in the short near-term, the outcomes will resonate within the community well into the long-term.